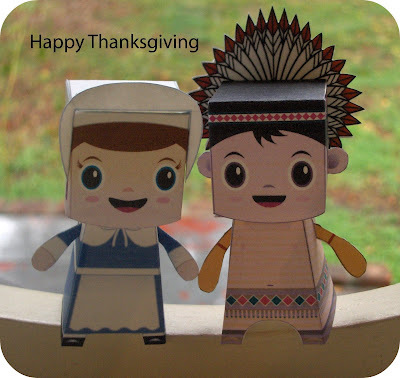 I found these cute paper toy patterns at Macula via Paper Kraft. The kid's and I made these today for a rainy day project. Well actually, I made them and the kids watched. It's a relatively easy project but just a little time consuming. I think it took me about an hour to two hours to make. It's kind of hard to gauge because I was doing other things in between making the toys. I would guess if you had a quiet house with no interruptions, you could make them in an hour. There's a whole set of Thanksgiving themed toy patterns at Macula. All the patterns appear to be free to download. There's also other patterns to choose from. Click here for patterns. Those are funny and pretty. I like those big eyes!! My husband loves the Paper Kraft site. I want him to bust out his exacto and fill up the printer with fresh ink and get to work on these for next year!